JUICY® JAY’S® papers are designed to enhance and mellow the natural flavors of legal smoking herbs. What’s the secret? A painstakingly slow process that not only flavors the paper but also sweetens it. This process has been a well-guarded secret for decades (notice that the only truly flavored papers in the world come from our factory). HBI has invested heavily into this factory in Alcoy Spain and refurbished the old machines from the 1920s. We have been able to offer many new flavors and sizes. The flavor itself just keeps getting stronger and tastier with each production! Each pack of these sweet, aromatic papers are hand packed and add pleasure to the herbal smoking experience. JUICY® JAY’S® makes many flavors for different tastes including Raspberry, Blackberry Brandy, Peach, Butterscotch, Candy Cane, Watermelon, Strawberry, Coconut, Banana, Chocolate, Menthol, Orange, Cherry, Blueberry and more. In order to fully appreciate these flavored papers, you should try one yourself. Simply lick one paper and you’ll instantly understand. Only JUICY® JAY’S® flavored papers are produced with our proprietary “triple-dipped” flavoring system. Flavored rolling papers are especially useful in smoking stronger tasting herbs such as passion flower or broom scotch flowers. The flavored papers mellow out the strong bite of these herbs and make them taste smoother overall. This is why Juicy® Jays® are so popular with herbal smokers. We all know that tobacco is dangerous for our health. Yet there are many smokers out there that don’t want to give up their blunts…We get that! So it was time to invent a product that bridges the gap between natural papers and blunts. PS. Want to know more backstory? Back in the early 1990’s, Josh was one of the first people to ever sell cigar wrappers. The first brands had funny names like “Uncle Poos” and “3 Leaf Blunt.” We began making our own cigar wrappers, and there is probably nobody else alive who has more experience and knowledge about cigar wraps. 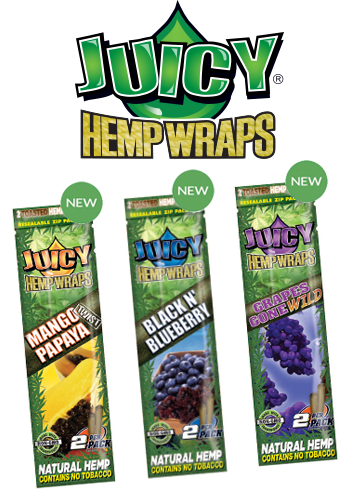 We put all of the years of experience we have into these Hemp Wraps to make them burn, taste, roll, and feel just like a premium tobacco wrapper. I think if you didn’t tell people there was no tobacco they wouldn’t even know (except the experience is better so they might catch on after a few puffs). Enjoy the next level!